Today I´ll show you two projects where I used the sketch from Saturday as my inspiration. I loved that the sketch had so many photo slots! Christmas is a time of the year where I take many pictures and often I have several I´d like to use. Making a collage is the perfect way to include many photos on one layout. I use Picmonkey and they have a variety of collages to choose from. It is easy to use also! Next I made a card. I used my watercolors to create the blocks (photo slots) on my card. Here is what the card looked like when it was all dry. Next I added several rub-ons and stickers. I thought it was a fun way to play with the sketch! If you have been a scrapbooker for a while you are sure to have them; left-over letter stickers. Right?! I have a big stash of odd letter stickers that are not being used mainly because they are out of vowls. But also because I don´t like the style or color. I have a few tips on how to use them anyway! I created this page on how I miss my Sadie dog like crazy. For this I made a cluster with odd letters (still from the same set) and to make the title I used a different color letter stickers to make it stand out. Another example is to use number stickers on a birthday card like I did above. I used chipboard letters for this art journal page. The letters were all white and I painted over them to create unity. I had several older sticker sheets with colors I wasn´t so keen on anymore. I didn´t want to just toss them since there were still quite a few letters still. So, I simply painted the whole sheet with black craft paint. Suddenly I had a whole lot of “new” black letters that I find easier to use! And here is a layout where I have used one of my "new" letterstickers! I hope that I could give you some inspiration for using those unused letterstickers! as it seemed like a wonderful layout from which to create one with its ten photos!! Look how it turned out. When it came to making my layout, I moved the photos to a middle strip. It seemed a little more orderly with my photos having so much color, design, and varied perspectives. I think it was the right decision. Amy switched it up a bit, too, using fewer photo, but still maintaining the spirit of the sketch. And let's not forget that our sketches work equally well for cards. Kate made a lovely one as a reminder. That one will certainly be making an appearance at my house! Love that! If you would like to purchase a limited time offering of the layered template, you may do so by clicking below! Thank you for choosing to spend some time with us this weekend!! We adore you! Hi there, it's Cristina here with some embossing inspiration for you. Since I got into scrapbooking through digital scrapbooking, I missed out on a lot of traditional tools. I am gradually catching up, though, ever since I got into paper scrapbooking when I started Project Life. A couple months ago, I took the plunge and bought a manual die cutting machine. After considering other options (mostly the Cuttlebug, which is smaller and less sturdy, but cheaper), I decided to get the Big Shot. My main motivation to buy it was to use it as a cutting machine with wafer thin dies, but I also bought an embossing folder, just to try it out... and since then I have fallen in love big time with embossing! I really love the results! Here are a few cards I made for my Project Life album. The process is so quick and easy, and works with pretty much any kind of paper. I love to add watercolors or stamping to the embossed cards, and I even tried the faux letterpress look. I love to use watercolors to accent my embossed cards. This first example uses a thick grid card from Studio Calico. Since I wanted to use watercolors heavily on this card, I needed thick paper that could hold that much water and paint. This card was done using a cheap index card from Staples. My watercoloring is done in a few spots and using little water, so the paper held up well. This next card was done on thicker paper. Adding a sticker and my photo, this card is ready to put in my Project Life album. As a big fan of stamping, I also love to combine embossed cards with stamped accents. Here's two examples. Finally, since letterpress is all the rage and I love the look, but don't own any letterpress plates nor paper, I have been playing with creating a faux letterpress look with my embossing folders. I just used some Hero Arts shadow inks to make this card (index cards from Staples). I inked the embossing folder with the ink pad, and ran it through the machine. Next, I cleaned the folder, inked it up with another color and embossed again. Seriously.. embossing, where have you been all my life?? ;) Are you a fan too? Welcome to Day 3 of this Anniversary Week! Today I will be sharing some inspiration for anniversary cards. I find it especially meaningful to give a homemade card to celebrate the sweet milestone of an anniversary. Some of the tips I shared on Day 1 still apply to cards. In particular, focusing on the numbers is always a nice way to build a card. Here's an example from me for our 6th anniversary. In this card, Laura cleverly used a bingo card for her in-laws' 49th anniversary. For my in-laws' 50th, I made a card that featured gold - the color of the 50th anniversary. Kate made this lovely card with a bold word art. Laura made these two cute cards with animal couples. Finally, this is the card I made this year for my husband. Come back tomorrow for some mini album inspiration! Welcome Back to Day 2! Amy here and I've got more fun ideas to share with you for using digital products in your paper scrapbook pages and projects. Today we're taking a closer look at Digital Stamps, also referred to as "brushes." Digital stamps can come in a variety of file formats dependent on where they are downloaded from but will almost always be offered in an easily-accessed file format like .png or .jpg. Digital stamps can range from handdrawn outlines, to full illustrations,to being offered in black, white, gray or even full color. Some digital stamps are distressed to mimic the appearance of actual rub-ons or stamps, while others have a cleaner look to them. No 1. 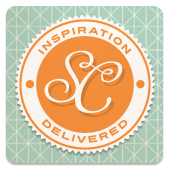 - You can use digital stamps to replace stamped images and sentiments on your handmade cards. Now I've never been a big stamper or card-maker, I just don't have the patience that is often required of these two skills. However, once it occurred to me to try out digital stamps on my cards I found that I was much more likely to take the time to make a card, rather than buy one. I made this no-fuss hybrid card, by simply printing a hand-drawn digital stamp by Creashens onto textured cardstock and adding a few simple embellishments. However if you're someone who prefers to put a little more effort into your handmade cards, digital stamps can also pair nicely with mediums like watercolors, copics and more (though laser printing is usually recommended to prevent the ink from running). No. 2 - You can use digital stamps to make your own stickers, rub-ons or even fabric transfers. There are a wide variety of printable mediums available to crafter's today, including sticker paper, transfer paper and rub-on film--just to name a few. Digital stamps can be paired with these products to make affordable gifts as well as physical embellishments for your scrapbook pages. The minute I saw this adorable ice cream cone digital stamp by Celeste Knight, I knew that it would look great on a cute little tee for my niece. No. 3 - You can use digital stamps in lieu of real stamps on your scrapbook pages. There are two things that appeal to me about using digital stamps over the use of acrylic cling and wood mount stamps in my paper scrapbooking: 1). Digital stamps are less expensive and take up less physical space and 2). With a digital stamp, I feel like I have more control over the final result. In my page, Coming Into Focus, I printed this awesome f-stop digital stamp by Shannon McNabb onto a vellum mat which I layered over my patterned background. The digital stamp acts as a foundation for my design and creates a striking focal point, that captures and guides the eye. Get started today by picking one of these ideas for using digital stamps to try out in your next page or project. You can find a large selection of FREE digital stamps hand-drawn by Michelle Houghton over on the Get It Scrapped blog or try searching "free digital stamps" on Pinterest. Join me tomorrow for ideas on using digital journal cards in your paper scrapbook pages and projects! Hello everyone! Welcome to the final day in our card sketch theme week. Today I'll be sharing some thank you cards. Like birthday cards, you can never have too many of these on hand. I like to keep them in my desk at work so I always have one on hand to give to someone going the extra mile. This first card is from Amy. I like how she added the embellishment cluster and gratitude quote on top of a die cut background. Laura shared this beautiful butterfly thank you card. I like how the greeting is extending in from the right side of the card, surrounded by the butterflies. Valerie added some fun with mixed media to her card and placed the greeting in a tab along the top...so clever. On my thank you card I kept one large embellishment along the bottom and added the smaller embellishment cluster and greeting towards the top. On my last card, I used one large focal embellishment and moved my greeting to the side and added a smaller subtitle to the bottom. Thank you so much for joining me for card week. I hope you can use the sketch and these ideas to create a card stash for any occasion. Hi everyone! Welcome to another day in our card week. Today I am sharing congratulations and good luck cards. I always like having these on hand to let someone know I'm hoping for the best for them or to let them know I'm happy for their accomplishments! All cards were made using the sketch I posted on Monday. Stars are one of my favorite embellishments and perfect for a congratulations card, like Laura used on this card. Jennie also used stars on her congratulations card. She kept the layers of the sketch the same and moved the greeting to the bottom creating room for the wonderful star/circle grid. Kate shared this next card. Kate, followed the sketch closely but I like how she converted it to a square card and moved the greeting up. Sue created the colorful butterfly card. I like how she simplified the embellishment triangle to one large butterfly atop a washi background. For my first card, I rotated the sketch. I created the top layer by using washi tape for the background, then added my greeting in embellishments. My next card features my favorite...stars, and follows the sketch almost exactly. For this next one, I used the exact same design elements but switched out the stars for circles and added a "good luck" greeting instead. For my last card I switched out the three embellishments for one large one and again added a "good luck" greeting. Thanks so much for visiting. Come back tomorrow for our final card day.